Virtually identical to human embryonic stem cells (hESCs) except for their origin of isolation, the recently created induced pluripotent stem cells (iPSCs) (Yu et al., 2007; Takahashi et al., 2007) hold much potential for use in regenerative therapies. iPSCs are cells that were originally from adult tissues, but have been forced to produce proteins that are thought to be essential for the pluripotency of human embryonic stem cells. By making cells express these embryonic stem cell proteins, adult cells can be created that look and act nearly identical to hESCs. Applying Somatic Cell Nuclear Transfer in the Creation of Dolly the Cloned Sheep. 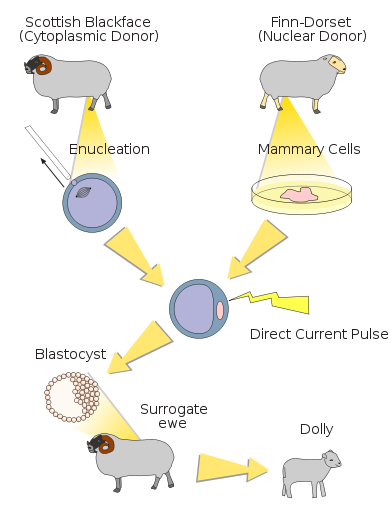 Dolly the sheep was cloned through somatic cell nuclear transfer (SCNT). An adult cell from the mammary gland of a Finn-Dorset ewe acted as the nuclear donor; it was fused with an enucleated egg from a Scottish Blackface ewe, which acted as the cytoplasmic (or egg) donor. An electrical pulse acted to fuse the cells and activate the oocyte after injection into the surrogate mother ewe. A successfully implanted oocyte developed into the lamb Dolly, a clone of the nuclear donor, the Finn-Dorset ewe. The idea of reprogramming a cell from adult tissue into an embryonic-like, pluripotent cell existed long before the creation of iPSCs. In 1938, Hans Spemann showed that a nucleus from a fertilized salamander egg that had already undergone cell division several times could be implanted into a cell from a newly fertilized salamander egg that is enucleated (has had its nucleus removed) and create an entire adult salamander (Spemann, 1938). Consequently, Spemann’s work suggests that an embryonic nucleus remains totipotent, or is able to develop into any cell type of the adult body, even after several cell divisions. Due to technical difficulties, it was several years before researchers could repeat these experiments using older nuclei to see how long the nucleus retains its pluripotency. In the early 1950s, Robert Briggs and Thomas King repeated Spemann’s experiments using a species of leopard frog, Rana pipiens, first with a nucleus from young embryos (Briggs and King, 1952) then from older embryos (King and Briggs, 1954); both the younger and older implanted nuclei could still be reprogrammed by the enucleated host cell. However, they also observed that the older the donor nucleus was, the more difficult it was to reprogram it to a totipotent state. For years it was unclear whether the nucleus from a fully differentiated, adult cell could be completely reprogrammed, as conflicting results were published by different groups (Briggs and King, 1957; Fishberg et al., 1958; Gurdon and Byrne, 2003). Although the studies done by Spemann, Briggs, and King used nuclei from embryos, their results are the basis for somatic cell nuclear transfer (SCNT). SCNT is a technique wherein the nucleus from a somatic cell (an adult cell that is not a sperm or egg, i.e. not the gametes) is implanted into an enucleated egg cell which can then be implanted into, and develop in, a surrogate mother, and potentially become an adult organism. The resultant organism is a clone of the animal that donated the nucleus. The first widely-accepted successful use of SCNT came with the creation of the sheep Dolly in 1997, the first cloned animal from an adult cell and the first cloned mammal (Wilmut et al., 1997). Since then, several other animals have been successfully cloned, though many problems still remain and there are low success rates (Wilmut et al., 1997; Wakayama et al., 1998; Solter, 1998; McKinnell and Di Bernardino, 1999; Gurdon and Byrne, 2003). With the living evidence of Dolly and other animals cloned from adult cells, the idea that an adult somatic cell could become a reprogrammed embryonic-like cell regained a spotlight in the scientific community. The creation of iPSCs began by studying proteins not only uniquely expressed in embryonic stem cells, but proteins known to be functionally important in creating the unique properties of these cells. In 2006, Shinya Yamanaka’s group made the first iPSCs by applying this knowledge in mouse cells (Takahashi and Yamanaka, 2006). They made adult fibroblastic mouse cells become essentially mouse embryonic stem cells, in appearance and function, by forcing the fibroblasts to express four key embryonic stem cell factors: Oct-4, Sox2, Klf4, and c-Myc. The induced expression of these factors was accomplished through transducing the fibroblasts with, or making the fibroblasts uptake, a retrovirus vector that produced the DNA for these four proteins. The DNA was then incorporated into the genome of the fibroblasts and translated into protein by the host cell. The same principles applied to the creation of human iPSCs, which was reported only a year later concurrently, though independently, by the laboratories of Yamanaka and James Thomson (Yu et al., 2007; Takahashi et al., 2007). Yamanaka’s group used human adult dermal fibroblasts and induced them to become iPSCs, appearing and functioning like hESCs, by having them express the same proteins as he used with mouse cells: Oct-4, Sox2, Klf4, and c-Myc (Takahashi et al., 2007). Thomson’s group also created human iPSCs, but used fetal fibroblasts and foreskin fibroblasts and a different set of proteins; while both groups used Oct-4 and Sox2, Thomson’s group used Nanog and Lin28 instead of Klf4 and c-Myc (Yu et al., 2007). Even though different cell types were used as the initial starting materials, and they were made to produce different sets of proteins, both groups were able to identify and isolate hESC-like cell colonies only 20 to 30 days after transduction. Both groups reported that some factors were more important than others in inducing the adult cells to become embryonic; Oct-4 and Sox2 appear to be essential. Though iPSCs and hESCs are both pluripotent and have a virtually infinite supply, there are distinct advantages and disadvantages associated with each cell type. Being created from adult cells, iPSCs overcome some ethical concerns associated with hESCs and can potentially be patient-specific, but may also have shorter life spans than hESCs due to the donor cell age. Additionally, iPSCs originally generated contain DNA randomly inserted into the genome from the retroviral vectors. However, iPSC technology has been making great leaps and bounds in the three years since their creation; researchers have found ways of making iPSCs with non-integrating vectors (Yu et al., 2009) and, more recently, have created iPSCs without directly altering the adult cell genome at all but instead delivered the key reprogramming proteins to the cells (Zhou et al., 2009). Researchers are quickly overcoming the hurdles to using iPSCs in human clinical trials, though some issues still remain to be addressed. Briggs, R. and King, T. J. Proc. Natl. Acad. Sci. 1952. 38: 455-463. Briggs, R. and King, T. J. J. Embryol. Exp. Morphol. 1957. 100: 269-312. Fishberg, M., Gurdon, J. B., and Elsdale, T. R. Nature. 1958. 181: 424.
admin	Embryonic Stem Cells, Induced Pluripotent Stem Cells	adult, embryonic, history, news	© 2009-2010, Teisha Rowland. All rights reserved. Great article! It’s comprehensive yet easy to follow. Very interesting article… I find myself amazed at how much work one or two labs can churn out to advance our understanding– Perhaps you could do a post on current Stem Cell centers around the world, and how much man-power and budget is being devoted to them? Thanks for starting this site! Do you know where i can find info about how they really came down to using these 4 factors? because i remember reading somewhere (and correct me if im wrong) that there are some 24 factors that need to be deleted to get the same effect and then they somehow narrowed it down to 4…. The factors were actually added to, not deleted from, the original adult cells that were reprogrammed into iPSCs. In Thomson’s paper, they list nearly 100 factors that they made vectors for originally to test (this is in supplemental table 1). But, they then tested 14 of these genes in subsets and this is how they found the core 4 that worked best to reprogram the cells. I hope this helps explain it! The original papers are the best source to look at, though sometimes they can be confusing or leave out details. When the somatic cells are initially reprogrammed with the 4 genes and then allowed to divide, do they go to a blastocyst-like stage in which cells are taken to generate and perpetuate the iPS, or is it something different from that?